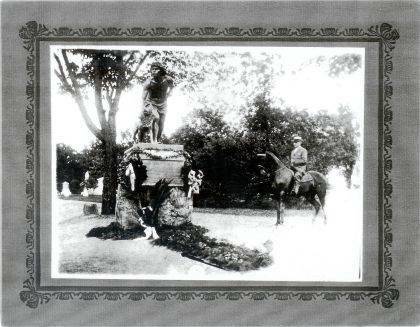 This photo shows the dedication of the Indian Hunter statue in Oak Dale Cemetery in 1914. The Looking Back featured photo today (CCHS #1893) is of the dedication of “The Indian Hunter” statue at Oak Dale Cemetery, Urbana, on June 27, 1914, the year that President Woodrow Wilson sent Urbana native Brand Whitlock to Brussels as the country’s minister to Belgium. This sculpture by Urbana native John Quincy Adams Ward, currently under restoration, is a duplicate of the original sculpture erected in Central Park, New York City. “ … the unveiling of our replica of the Indian Hunter to commemorate J. Q. A’s 84th birthday.” Ward died in 1910, but his birthdate was chosen as the occasion for the ceremonies associated with the placement of the Indian Hunter in Oakdale. Submitted by the Champaign County Historical Society, an all-volunteer, not-for profit organization that preserves, protects, archives and displays the artifacts that tell the Champaign County story. The society depends upon donations and dues to provide a free public museum, which is open 10 a.m.-4 p.m. Mondays and Tuesdays and 1-4 p.m. Sundays.